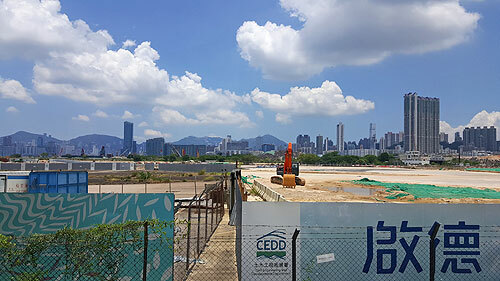 The tender for a Kai Tak site has been awarded on a 50-year land grant at a premium of $11.26 billion, the Lands Department announced on January 23. New Kowloon Inland Lot No. 6551 at Kai Tak Area 4C Site 3 was awarded to Well Capital (HK) Ltd, a subsidiary of Sun Hung Kai Properties. It has a site area of 10,956 sq m and is designated for non-industrial purposes excluding office, godown, hotel and petrol filling station. The minimum and maximum gross floor areas are 36,155 sq m and 60,258 sq m.
On January 22, Secretary for Development Michael Wong told lawmakers that the implementation of the Kwu Tung North and Fanling North New Development Areas is a measure to increase land supply. Mr Wong noted that upon full development, the areas will yield a total of about 71,800 housing units, of which about 70% are public housing. Population intake is expected to start in 2023. The whole area will house a new population of about 188,100. There will also be about 868,000 sq m of floor area for economic activities, generating more than 40,000 jobs. Mr Wong added that after more than 10 years of planning, consultation and preparation, if the funding applications are approved by the Legislative Council, it will take the two projects to another key stage. The government also plans to develop some 37 hectares of land at the core area of Long Valley into a nature park for conserving and enhancing the ecologically important environment.